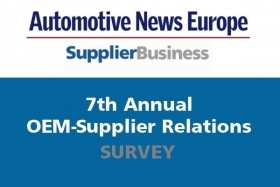 The 7th annual Automotive News Europe/SupplierBusiness OEM-supplier relations online survey is underway. The survey runs until June 10 and can be found at www.supplierbusiness.com/relations. All participants receive a copy of the final survey results, which will be highlighted by the updated SuRe index, a performance metric for OEM-supplier relations developed by SupplierBusiness. The results will be presented at the Automotive News Congress in Cologne, Germany, on June 30.